December 1, 2014 – Lockheed Martin has completed thermal vacuum testing on the fourth satellite scheduled to launch and join the U.S. Navy’s Mobile User Objective System (MUOS) constellation. This milestone comes just weeks after the company shipped the third MUOS satellite to Cape Canaveral Air Force Station in anticipation of its January launch. Completed November 12, thermal vacuum testing was conducted inside the Dual Entry Large Thermal Altitude chamber at Lockheed Martin’s Sunnyvale, California satellite integration facility. 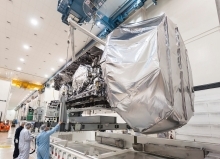 MUOS-4 now proceeds to final integrated system testing prior to launch later next year. Lockheed Martin is currently under contract for five MUOS spacecraft. On November 5, MUOS-3 was shipped to Cape Canaveral Air Force Station, Florida in support of a January launch. MUOS-2 was launched and handed over to the Navy for operations in 2013. MUOS-1 was launched and became operational in 2012. MUOS-5 is expected to launch in 2016.